Recently I have been spending a lot of time on the earthclinic.com website and during my time there I found out about Transdermal Magnesium Therapy (TMT) using magnesium oil. It’s something I’d never heard of before but it intrigued me because I have been reading a lot lately about the importance of magnesium. The reason that I have been researching this is that many of the symptoms of magnesium deficiency seem to apply to me including back and neck muscle pains, muscle twitching, stiff muscles, fatigue, memory problems, sensitivity to bright lights and heart palpitations. And it seems that I’m not the only one it seems as it is estimated that approximately 68% of people in the USA suffer from magnesium deficiency. The Swanson brand is way cheaper and their magnesium seems to be sourced from the same region as the Ancient Minerals brand. Not sure why the massive difference in price between the two brands. Even some of the reviewers on Amazon who have tried both can’t tell the difference. Either way, I am not about to spend that sort of money when I can make it easily at home for a fraction of the cost but I’ll get to that further on in this post. So What is Transdermal Magnesium Therapy? Transdermal Magnesium Therapy (TMT) is a way of getting magnesium into the body without having to ingest it. It involves applying magnesium oil to the body and magnesium oil is simply a mix of magnesium chloride and water. Technically it’s not an oil at all but it feels oily which I guess is how it got its name. Now you can take various forms of magnesium internally if you wish however the problem with doing that is that magnesium can have a laxative effect…great if you are constipated but that’s not my problem. Also if you are taking any sort of medication, it may affect the amount of magnesium that is absorbed. From what I have read so far, it appears that TMT is greatly superior to oral supplementation in that the magnesium can be better absorbed into the body. “When people are ill, faced with magnesium deficiency and poor digestion, what do you think the odds are of fixing that problem with oral magnesium supplementation and digestive enzymes alone?” asks Dr. Ronald Hoffman. Mildred Seelig, Ph.D., renowned researcher of magnesium, predicts it would take 6 months to normalize magnesium levels in a woman who is magnesium deficient with oral supplementation. In his clinic Dr. Hoffman carefully measures magnesium and found that many patients with low magnesium who take just oral supplements do not normalize. The bottom line is that transdermal magnesium therapy speeds up the process of nutrient repletion in much the same was as intravenous methods. Like intravenous, transdermal application of magnesium can deliver higher doses of this key mineral to the cells. Bypassing digestion allowing for deeper tissue saturation. As I mentioned above, most of the commercial magnesium oils you buy are made up of approximately 33% magnesium chloride and 77% pure water. I prefer a consistency of 50% magnesium chloride and 50% pure water. It’s up to you which amounts you want to start with but just remember that magnesium oil does sting when applied to the body so the stronger you make it the more it will irritate the skin. So if you have skin allergies then you might want to start out with a smaller quantity of magnesium chloride – say 20% or even less and work your way up. Because I am in Australia I can’t purchase these items from Amazon so I have sourced my magnesium chloride flakes from Nikita Naturals. I use pure water to make my magnesium oil. I figure that this stuff is being absorbed into my skin so I should use the best possible ingredients. I have a few recipes here for making magnesium oil depending on how you want to use it. Remember that these are just my recipes so adjust them to suit yourself. Note: If you would like to start with a lesser concentration then try 1/3 a cup of magnesium chloride flakes with 2/3 cup of pure water or even less if you have particularly sensitive skin. Boil the water first and then mix with the magnesium chloride flakes until dissolved. Allow to cool before use. That’s it. Your done! You now have a batch of magnesium oil ready to use. Easy wasn’t it? I keep mine in a plastic spray bottle but you can store in a regular bottle or jar. Magnesium oil can be applied directly to the skin. Ensure your skin is clean before applying. I use a spray bottle and simply spray over my entire body. You can also apply to just the arms and the legs and then rub it in to the skin. It will sting and be a little itchy. I also use it on my face by spraying a little into my hands and rubbing in to the skin. Just be aware that it can cause irritation so always spot test before using on the face. I had a small cut on my finger and it stung quite a bit when the spray got in there so be careful to avoid cuts and wounds. Now I have read on a few sites that you should wash the magnesium oil off your skin after 20 minutes. Then again on other sites I have read that you can leave it on the skin. When I started using the spray I was showering it off after 20 minutes but now I use the magnesium spray after my shower and leave it on. Again its all a matter of experimenting to see how your skin reacts. Boil the water and mix with the magnesium chloride flakes until dissolved. Place in a foot bath and leave until cooled slightly…you don’t want to burn your feet but you want the water to still be warm. Soak your feet for 20 minutes. Wash your feet in warm water after use or wipe down with a damp cloth. I simply fill up the bath tub and add 2 cups of magnesium chloride flakes and then soak for 20 minutes. Two cups probably isn’t anywhere near enough and one day I will try it with a bigger dose. Combine the ingredients in a jar or bottle and shake well. Apply to the skin like you would any other moisturizer. Test first before applying to the face. I have no problems with it but if you have sensitive skin just spot test first. How have I been using magnesium oil? magnesium spray once a day on entire body. You can do this at night before going to bed or after your morning shower. Did magnesium oil work for me? It’s too early to tell yet – I’ve only been using it for a few days now. What I have noticed though is that after using the magnesium oil (which I usually do at night) I do feel quite relaxed and generally just want to go to sleep. They do say it is good for insomnia. I also have quite a bit of trouble waking up in the morning – I usually feel like I haven’t slept at all and in the past couple of days my mornings have been a little easier – not a massive difference so not sure if it has anything to do with the magnesium as yet. I really want to try this for at least a month to give it a good test. Some say you should keep at it for a few months to build up magnesium levels so I will see how I go. Where Can You Buy Magnesium Oil? Where Can You Buy Magnesium Chloride Flakes? I’ve purchased both of the books below and they are excellent resources for magnesium info. I was wondering what the difference is between flakes and powder from nikita or elsewhere? I read somewhere that flakes have move water in them. Dunno if that is true. Any ideas on the differnece between the two forms? I no longer buy magnesium from Nikita. I requested the chemical/product composition analysis and it turns out the their magnesium contains harmful heavy metals. I refuse to ingest and spray heavy metals onto my body. Ancient Minerals contain no heavy metals like arsenic that Nikita’s Japanese sourced magnesium contains. Ancient Minerals can be bought in Australia from http://www.rejuvehealth.com/Ancient-Minerals/View-all-products.html. Its good to hear from someone that has actual done a bit of testing. Are you going to get the Ancient Minerals tested as well? 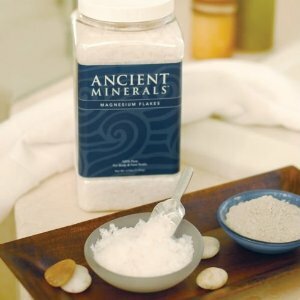 When I run out of my latest source I am going to give the Ancient Minerals a try. You can also buy on iherb.com and they will send to Australia. We buy products from them all the time now and we get the orders within a week when we select the DHL option. It actually gets here a lot quicker than products we order online in Australia. The labelling of Food Grade does not ensure it is FREE of heavy metals and other toxic substances. It just has to be below a certain level. Since when does the body need a recommended daily amount of heavy metals? The Ancient Minerals are safe and do not contain harmful metals and other substances. again you can request a copy of the test results from them done by an independent company that are also verified. Ancient Minerals seems to be the best available at this time. I make my solution of 1 cup salts to 1 cup distilled water and then spray on my skin 10-15 times daily or add two bug pinches of salts to a glass of water, sometimes both. No idea how much I’m getting. Do you know how much magnesium there is in the concentration of 1 cup to 1 cup? I bought both the flakes and the powder from Nikita Naturals. The powder was labelled as food grade whereas the flakes weren’t. Also I think the powder is in a more concentrated form but you might want to contact Nikita Naturals directly for more detailed info. Other than that I am not sure if there are any other differences between the two. I have looked on the net for an explanation but haven’t found any as yet. You definitely have nothing to lose. It is cheap enough to buy to try out and a lot of people have had success with arthritic pain. I really like soaking in a hot tub with magnesium flakes – it’s very relaxing. if i do 1 cup of flakes and 1 cup of water, then how many mg’s of magnesium i wll have per 1 spray? Hmm, not to sure how to answer this one. Maths was never my strong point. Hi Legna, sorry about the late reply, only just caught the thread. Now magnesium flakes are only 50% concentrated, so the above figure decreases to 0.5 times B magnesium in one cup of water. Now to find out how much magnesium in one spray, you need to spray into the measuring jug until you get a cupful. say “N” sprays. First let me compliment you on your efforts in both creating a positive lifestyle and sharing your knowledge and experiences with the public. I just stumbled upon your blog and honestly wasn’t hunting for info on Magnesium, but I am interested. I recently learned that Magnesium is extremely beneficial and actually has the same bone building benefits as calcium. I have recently made the decision to point my life towards a chief aim, which has caused me to begin learning about anything that may improve life as I know it. Your site is a great resource in doing just that. Not many people realize the importance of magnesium. The focus always seems to be on calcium for some reason. And thanks for your lovely comments Vince. The beauty of making your own oil is that you can control the quantity of magnesium that you add to it. The oils you buy over the counter are usually made up of around 30% so you will be able to make a stronger mix. Have you also considered MSM? It might be worth a try. I have been taking it for a while now and notice that my upper back-pain (muscular) has disappeared. I am currently taking 1 tablespoon in orange juice each day but you would want to start out a little slower than that. Thanks so much for this one-stop-shop with so much excellent info! You’ve just saved me a ton of time and money. May I recommend something I read in “The Magnesium Miracle”? Apparently we should be getting about 900mg of Magnesium daily – but if we take it all at once, whatever isn’t used is simply passed out of the body. The author recommends taking Magnesium about 4 times daily (including first thing in the morning and just before bed). Perhaps you’ll see results more easily if you ramp up the number of times you spray. This article’s a keeper! If you don’t mind, I’m going to include it as a reference in the “Public Library” section of the website I’m setting up (by March 20th)- Alzheimer’s Hope. Feel free to contact me! Thanks for the info Shannon and yes you are quite welcome to add the article as a reference on your website. I measured out 1 cup of magnesium flakes and then weighed it. It came out at 300 grams. You published this post in June… It’s mid-August now; what are your results?? That was June last year. I tried it all for about a month and then got lazy. But I still take baths in it which is maybe why it is maintaining things for me. I don’t have the twitching eyes or muscle aches like I used to and the heart palpitations only happen very rarely. And I don’t find that I am so sensitive to light anymore. So I guess you could say that it was a success. Hi, Just found your recipe for Magnesium cream and gave it a try this morning. Seems to work fine. Try grinding your magnesium flakes in an old coffee grinder, and they seem to dissolve better than using whole flakes.